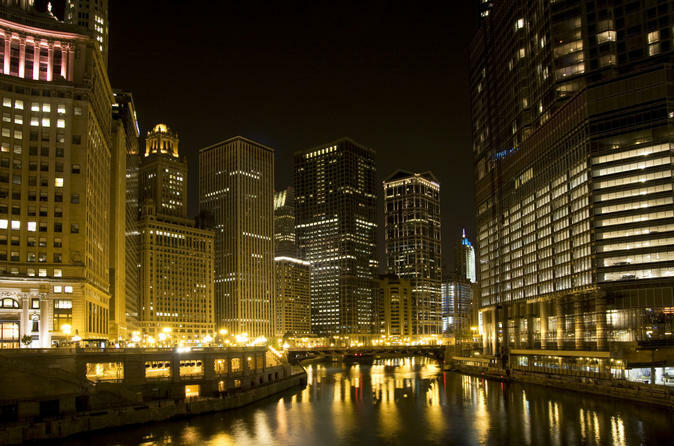 Discover the ‘shadier’ side of Chicago during a late evening kayak tour that takes you to reportedly haunted sites along the Chicago River. As you paddle past landmarks built during the city's unprecedented 19th-century boom, you’ll learn about Chicago’s mob-filled past and the legacy left by gangsters such as Papa Johnny Torrio and his protégé, Al Capone. Enjoy personalized attention on this small-group tour, limited to 8 to 10 people per each professional guide. Cruise through downtown Chicago on an evening kayak tour. Make your way to the East Bank Club river walk in the River North neighborhood of Chicago, where you'll slip on a life vest and practice paddling techniques before hopping into a single or double kayak, depending on your skill level. After launching into the tranquil evening waters, follow your guide through the downtown segment of the Chicago River, which borders city skyscrapers like Willis Tower (formerly Sears Tower). As you paddle, listen to sordid stories about the Windy City, coined ‘hustler town’ by author Nelson Algren, who wrote Chicago: City on the Make. Discover how the railroad boom of the mid-1800s led to an explosive growth of business that gave birth to the city’s gritty side. Check out the river’s supposedly haunted spots, hear about Chicago's first crime lord, and learn how criminal empire gangsters like James 'Big Jim' Colosimo, Johnny 'Papa Johnny' Torrio, and Al Capone contributed to Chicago’s infamous violence and mayhem. Your tour ends when you return to the starting point.